Oh sweet baby cheeses… we’re talking cheese on fire here, people. If you’re not adverse to a wheel or three of the good stuff, you’ll be absolutely drooling over this cheese-wheel-on-roids style pasta serving that’s just hit the Gold Coast. The cheese wheel phenomenon that’s already got tongues wagging in Brisbane is now being dished up at the coast’s deli-style favourite, Salt Meats Cheese. 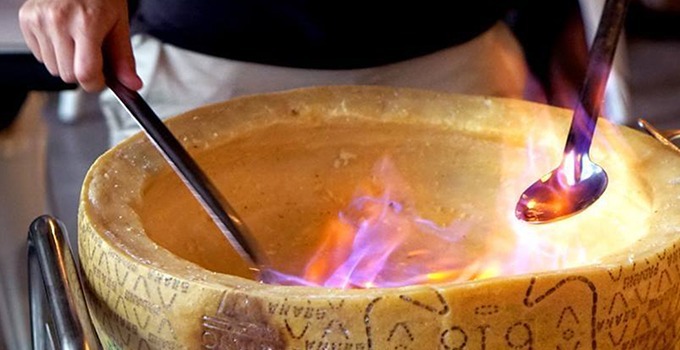 If you love a sneaky nip of alcohol, you’ll love hearing how they melt this bad boy: warmed brandy is set on fire inside a pre-hollowed wheel of Parmigiano Reggiano (yes… alcohol AND cheese. Please remain calm). Can’t pronounce it? No worries! All that matters is that this deliciousness tastes like a gift from the cheese gods and we can’t get enough of it. Let’s be real, the melted cheese on its own would be satisfying enough, but the good people at Salt Meats Cheese make a meal out of it by adding in the freshest pasta that would make any Italian nonna nodda her head in approval. Now, Salt Meats Cheese is currently only located at Surfers Paradise, BUT they will be opening a Brisbane store sometime soon (so keep a keen eye on the inside scoop). Until it opens in Brisbane, roll on down to Salt Meats Cheese Surfers Paradise store and let cheesus take the wheel.